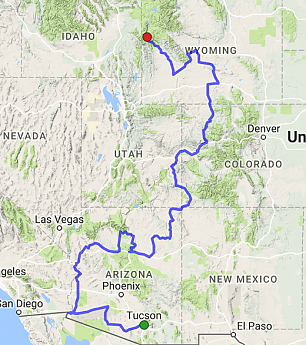 I have extended my bicycle tour all the way to Jackson WY from Tucson. This is my route. I plan to spend March cycling to Flagstaff and April/May to do the rest. I am trying to take new roads I have never been on before by bicycle. I still seem to be the only one at Trailspace to do and report on bike tours? Its just as interesting and challenging as backpacking, climbing and paddling. I am looking forward to the many nights of camping and seeing different sunrises and sunsets and riding along by human power as cars and trucks zoom by. Most people in vehicles just don't understand why anyone would want to bicycle farther than across town, especially when they, (like me) are over 60! Since 1982 I have done about 75 bike tours. I only once had a motor vehicle in 1872 when I was 16 with a 49 cc Moped. I tour mostly the USA but did go across Ontario Canada, during part of my longest tour in 1983-84 when I rode 7000 miles around the USA. I was 26 when I did my first ride in September 1982 of 1900 miles which took me 21 days from Jackson WY to Hope AR. After my before mentioned 7000 mile tour I was hooked. Previously before my first tour I hitchhiked everywhere from June 1977 to May 1982. I have taken Greyhound/Trailways and some smaller shuttle buses, but always have hated the confinement of being in a seat in a vehicle all day or night. Cycling is like pure freedom! Its like walking just faster and I can go 3-5 times farther in a day as I can hiking. Not that walking is un-pleasurable, I get to see the world at a almost snails pace, I see wildlife and other things up close and sometimes personal. I had a Cow Moose in Denali National Park chase me, have encountered many open range cattle that would not let me pass as they walked the roads. In Wyoming Buffalo are a common sight on the road neat Grand Teton Park. This was my loaded bike on my last tour from Flagstaff to Tucson last fall, it will look pretty much the same way this trip. I carry just basic gear, tent,sleeping bag,sleeping pad, spare clothes,camera, binoculars, cook kit and water bottles. About 20-30 lbs depending on food and distance between towns. One this tour my first town will be Why/Ajo AZ about 120-130 miles west, so I am starting with 6 days of food as I plan to start slow and ride only mornings as its going to be in the mid to upper 80's by afternoons. 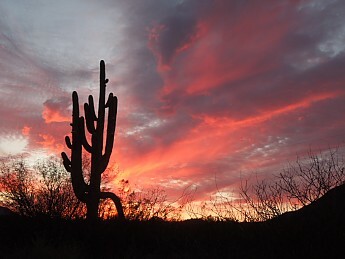 Plan to ride mornings and day hike afternoons in the desert washes for trails. Once I have been on the road a week I will have gained muscle power to start going farther. After Ajo its 155 miles to Yuma AZ. There I will turn north to Kingman along the California/Arizona border. As possible I will post trip reports. I am taking off next Friday morning the 3rd of March. Looks like you will be going by Canyon de Chelly. I did a lot of work there in the 70s (1970s, to be clear). It is a fascinating place and well worth your time. Gary. I think the majority of folks end up here due to backpacking interests and don't really do much biking except for the mountain bikers. You are the only one I see posting longer tours but that doesn't mean it's not interesting to those of us who just plod along. I am sure it I just as challenging as hiking and paddling. Keep us up to date and I look forward to hearing about your progress. Looks like an amazing trip, I previously have done a bit of bike touring and just recently switched to hiking, but still want to do more touring in the future (I hope to do the Erie Canal). I hope all goes well on your trip and look forward to reading some up dates. Best of luck. " I am really intrigued by your tour plans. We have done a fair amount of backpacking (my wife and I the AT, a part of the Continental Divide and a part of the Pacific Crest, then, with children the AT from Massachusetts to Monson, in two sections, the Long Trail, in two sections, a part of the the IAT in the Gaspie, and the Colorado Trail). Our feet have started to get worn out, so last summer my wife and I went on an out and back two night bike ride/camping trip with a hike up Mt. Monadnock in the middle day. It was a blast! The variety was great, it was fun to eat supper at a roadside joint, and instead of driving to a hike, which is at least sort of ironic, getting to the hike was actually part of the hike. What is under your blue cover? a milk crate? I don't do much in the way of biking tours, but I do ride a bike a lot. My current ride, a Bianchi Giro, has about 65,000 miles on it. Keep posting and keep updated. A lot of us enjoy the posts. The thing I want to understand, is how do you finance yourself. I've wanted to hike the AP m entire life, but would never have been able to afford more than a month off within a two year period, so could not do it. My other great dream was to canoe the Mississippi from headwaters to the delta, but that too, will never happen. Please tell me how you finance this. Our AT hike was a combination of things. My wife had a job on the school calendar (so she hiked for three months, from Georgia to New Jersey) and I had a random job working in a custom cabinet shop, which I quit to hike. When I got back, I got another random job at a marina. And then, we didn't spend much money while hiking. We bought our food at grocery stores, and not special hiking food, but rice and pasta and such, and didn't stay in motels when in town, and so on. It would be harder now that we own a house and have more bills and regular jobs- maybe impossible? The longest hike with those responsibilities has been a month- and that took some planning, but by keeping the hike cheap, it was more about carving out the time than it was about the money. Another couple we met on the AT were hiking in the window between leaving old jobs and one of them entering a graduate program in another state. A few years later, one applied to some colleges, and the other applied to some jobs in the same towns, and while they waited for offers, they rode their bikes from the Atlantic to the Pacific. THAT SOUNDS AWESOME! BE SAFE! HAVE FUN! SMILE! OUTSTANDING BEAUTY OUT THERE. I WAS OUT THERE FOR MY SON & WHAT I DID GET TO SEE FROM THE INTERSTATE HEADING BACK TO THE EAST COAST WAS GORGEOUS. WANT TO GO BACK & EXPLORE THE BACK ROADS & JUST TAKE IT ALL IN SLOWLY. MEET THE PEOPLE & TRY THE FOOD FROM THERE TOO! GOD IS WITH YOU ALWAYS! ENJOY! ONE QUESTION HOW DO THE PEOPLE DRIVING RESPECT YOU AS A BICYCLISTS ON THE ROAD? I work three to six months a year, usually in summers then take off the winters. I have done this for 40 years. I have never owned anything that cost more than a bicycle and I ride inexpensive ones, my current bike cost $125 at a event in Flagstaff AZ promoting Biking to Work, I bought it for transportation everywhere. 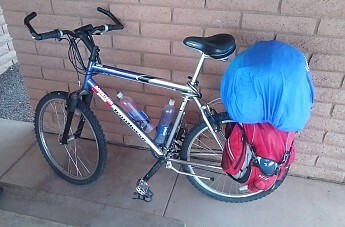 Under the blue rain cover is my sleeping bag, tent and sleeping pad strapped on my rack top. 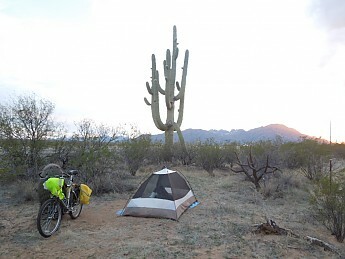 I decided after two days of riding that it was way to hot and dry between Tucson and Ajo, 130 miles of dry desert, so I have returned to Tucson and going to wait a month and go to Flagstaff again in April. Sunset the only night I was out about 35 miles west of Tucson and 3 Points AZ. I drank so much water that even tho I had enough water containers to haul as much as 9 liters in three Camelbaks and two water bottles, I just could not get enough. Plus you can imagine how heavy 9 liters is at 18 lbs. I had just 20 lbs of gear and food as well, I got back Saturday afternoon. #3 I will ask how far is it to so and so, they will say ; Oh about three hours, I will say oh, okay I will get there in 2-3 days, and they are like, Huh? I say well, I can't ride 60 mph. #4 Where do you sleep/camp? Along the road somewhere off the road if possible. #6 How far do you ride a day? 30-60 miles depending on weather,wind and hills. My longest day was 128 miles in 7 hours with a strong tailwind, my shortest was 3 miles with a strong headwind. Most people compare me to Into the Wild and Forrest Gump, I like those compliments! I had thought about retirement at age 62 next year, but now think as long as I can find summer work I will wait till I am in my 70's as long as I have my health and endurance. Plan now is tostay in Tucson till April then go to Flagstaff seek work or go on to Jackson WY again, will be 100 degrees here in a month. 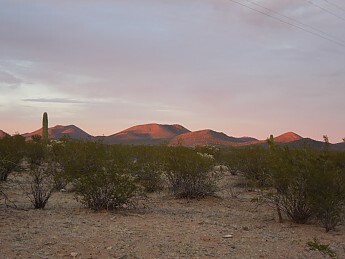 Sunset on the Roskruge Mountains NE of my camp. Enjoy your trip and have fun Gary! Keep us updated on your progress. I love hearing about your bikepacking tours, Gary. I'm getting into it myself, and your exploits are inspiring! Hope you are having a great time! Someday after I retire I hope to do some bike touring. 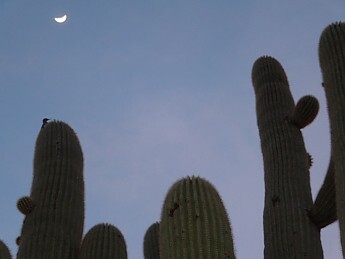 I guess ya'll didn't read my post above that I returned to Tucson last Saturday? It was way to hot and dry out in that western desert. I could not drink enough water to keep me going and after 3 Points there was no place to get water until Why/Ajo 120-130 miles away. I am back in Tucson waiting til late March then going north to Flagstaff then up along the route I was going to take from there to Utah. Had I been able to I should have left at the beginning of February when it was cooler. The sun radiating up from the pavement was just way too much, I only made it about 35 miles west of Tucson Friday. Topic: Extended my bike tour.